Automated engineering allows projects to be created partly or fully automatically. Depending on the application, this can happen by means of setting parameters in already existing wizards and tools, such as for the import/export possibilities of zenon Editor. Alternatively, however, zenon is controlled using scripts and macros or an external program, for which programming knowledge is required. Back in 1999, with the release of zenon 5, Visual Basic for Applications (VBA) was introduced in our software. Initially only for Runtime, in order to allow individual customer solutions for our standard product. Our CEO, Thomas Punzenberger, selected VBA because this programming environment, based on Visual Basic (VB) 5, was already sufficiently known from the Microsoft Office packages. The implementation was so successful that Thomas Punzenberger was even invited by Microsoft to Redmond to present the solution. The highlights of zenon 6 correspondingly included “automatic engineering” and “efficient reuse”. And this applies now more than ever. Intensive work has been dedicated to these issues in recent years. When VBA was no longer developed and .NET prevailed, we implemented Visual Studio for Applications (VSTA) in zenon – with the possibility to choose development in VB.NET or C#. In addition, we allowed XML export/import for virtually all zenon modules. A tip at this point: the interface for VBA and VSTA is the same. With a few exceptions in the Multi-Touch environment, the same functionalities are available in VBA as in VSTA. There are, however, more possibilities outside the zenon interface in VSTA. First, a very large integrated scope of functions is available with the.NET framework 3.5 and second, VSTA supports multithreading. In addition to VBA and VSTA, there is a third significant possibility for automation: an external program. In an external program, the zenon API is also available in full and can be used accordingly. The advantage of this option is primarily the free choice of the programming language. You can, for example, also use Java or other programming languages for your application. When do you use automated engineering? Creating a program for automated engineering yourself is time consuming and requires specialist knowledge. You should thus first always ask yourself the question: manual or automated? Yes, that’s right: you can also easily program zenon from Excel – using Excel VBA. You thus have exactly the same possibilities as in zenon directly. It’s very simple if, for example, you have variables in Excel and want to create these in zenon: you open the Excel table from zenon VBA or VSTA and read off the values. This is how the zenon Automotive Generator (zag) works, for example. On the other hand, you can also access the zenon Editor from Excel directly and create, modify or also delete zenon objects. For example, Siemens S7 TIA portal (see Figure 2), Allen-Bradley ControlLogix, OPC UA and many more. An old format that can still be used by Excel and Access. This file format is particularly suitable for semi-automated engineering in Excel, where mass processing is often easier to handle than in zenon, for example when modifying addresses. XML export/import is available for virtually all zenon modules. All data is exported (e.g. 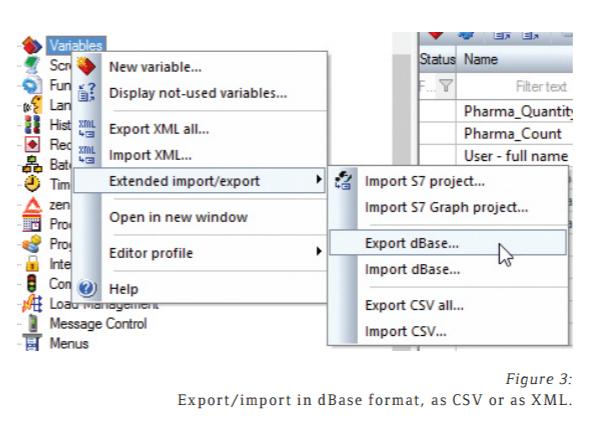 dBase and CSV only support four limit values). All files can be easily used with modern programming methods such as LINQ to XML. Methods 2 to 4 (see Figure 3) are particularly well-suited to automation purposes, because they can be used to create, modify and delete variables (and also other objects with XML). In addition to manual XML export/import, there is the particularly useful method of automating this process using the API. We even expressly advise doing this, because this way objects can be created or modified using the API directly. And with XML export/import, this usually works much more quickly because each object does not need to be handled individually. We recommend the following procedure: export all existing objects by means of XML. Then carry out the necessary changes in the automation tool (for example, by LINQ to XML) and import the file again. A freely-available example in which the XML import is shown is the project wizard. Create the corresponding objects (variables, screens, functions, scripts, recipes, users, etc.) once manually in the zenon Editor and then export these by means of XML into a template folder. This can also be automated if required. What is important for this is a uniform naming convention, for example when all templates start with the “tpl_” prefix. This way, an automation tool can identify all templates and process them automatically. With the screens, it is also possible to create templates using the screen template mechanism. The advantage in doing this is that the name, description, screen size and preview screen are included in the zip file. The most frequent application for automated engineering is surely use in conjunction with variables. Be it just transferring variables from other tools or issuing Modbus addresses, correcting driver configuration information or converting a driver to a different one, including manipulating address information. The large amount of data and the error rate of manual entries speak in favor of automation here. A very exciting possibility is offered in conjunction with zenon Logic, our integrated PLC system. The user positions graphic objects in a screen, in the form of symbols. In the background, the variables and detailed screens (faceplates) are then created by a wizard and even the PLC code is created. A further example in conjunction with zenon Logic is the metering point administration: when a metering point is created, the code to calculate the relative values is also created in zenon Logic. Many machine manufacturers use automation to individualize their projects. Instead of offering all options in a large project where options that are not required are deactivated for each individual machine, the machine project is tailor-made from a modular system with a wizard. The individual configurations are then stored as templates in XML format and are compiled as required. This configuration can also be carried out in part with external tools. The zenon Excel macro was developed by COPA-DATA consultants and shows how easy it is to create drivers and variables in zenon from Excel. 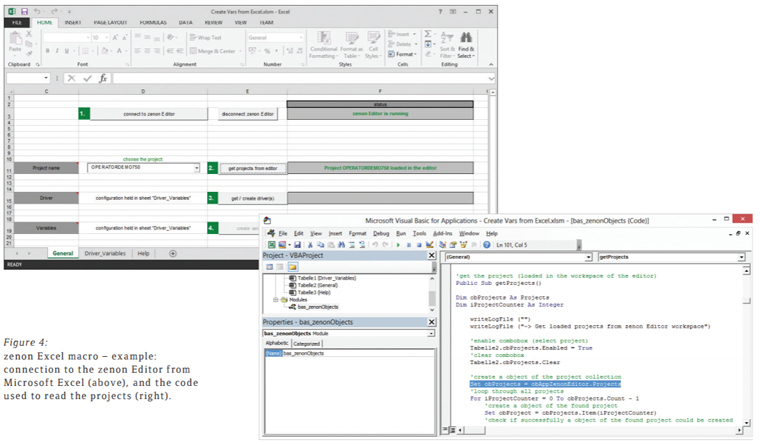 The example (see Figure 4) consists of an Excel table with its own macros and four buttons: the connection to zenon Editor is established with the first button; the second button provides all available projects; the drivers defined in the Excel table are created with the third button and the predefined variables are created in zenon with the fourth button. You can request this Excel file from COPA-DATA anytime. “zag” is a very efficient example of automated engineering. 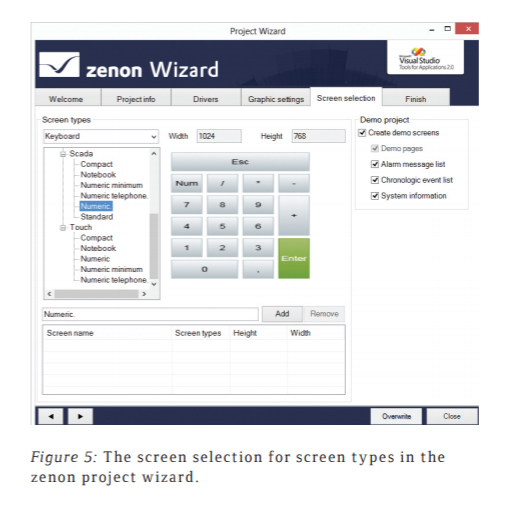 You can find details about it in the article entitled “Generate projects in zenon automatically: zag – the wizard for the automotive industry” on page 45 in this issue of IU. creating a driver for example. zenon standard and user-defined screen template selection and import. The wizard also shows how multithreading can be implemented. For example, this is how the zenon screen templates are read in their own thread. The wizard is VSTA-based and is available as source code. With automated engineering in zenon, you have a powerful tool at hand; compared to manual engineering you can save a great deal of time in project configuration and provide a significant increase in accuracy and reproducible results. zenon does indeed offer many possibilities out of the box for efficient project creation. However, with automated engineering, these can be multiplied and efficiency can be increased accordingly. We wish you much success with your automation projects!